Please note the disclaimer on the right! The new control "ISP" has been added with v1.23. Some plugin hosts do not like it to change the number of controls between saving and recall. Better save your existing LoudMax version or update it at the beginning of a new project. LoudMax is available as VST 2.4 Plugin for Windows and Mac OS X, Audio Unit Plugin for Mac OS X, LADSPA Plugin for Linux x86 and as Winamp Plugin. A SSE2-capable CPU is necessary (Pentium 4 / AMD Athlon 64 or newer). The Mac OS X Plugins are "Universal Binaries" with support for Intel Mac. The Audio Unit version was built with Symbiosis from NuEdge Development. The Linux Plugin has no meters since LADSPA doesn´t support a custom GUI. But it supports 5.1 surround modes. See README file in the LADSPA zip package for further informations. The Winamp Plugin also supports 5.1 surround. Built-in stereo overdrive protection avoids distortions in a subsequent stereo downmix. The Winamp Plugin has a simplified user interface. Only one slider for adjusting the maximum amplification. The maximum output level is 0dB. The GUI was designed by LimeFlavour based on the idea and colorscheme of Sinkmusic. Thanks to Hannes Druener for using his MacBook and testing. The higher the frequency, the greater the probability that the true peak will be between two digital audio samples. These true peak overshoots can be up to 3 dB for proper band-limited audio and even much more for pathological signals. This can become a problem not only with poor D/A converters, but also with subsequent sample rate conversions, e.g. from 44.1 to 48 kHz or vice versa, and the use of audio compression such as MP3 or AAC. For more information see the "Tutorials" section. When ISP is turned on, four additional samples are calculated between every two samples present. This reduces true peak overshoots for proper band-limited audio to 0.2 dB and for pathological signals to 0.5 dB. ITU-R BS.1770: There are coefficients given in this recommendation for the calculation of inter-sample peaks. Unfortunately these coefficients do not seem very accurate. They have a negative effect on transients and lead to high overshoots in true peak meters that use higher quality upsampling. Therefore LoudMax uses optimized coefficients that do not affect transients and reduce the overshoots to similar values with all true peak meters tested. The downside is that BS.1770 calibrated true peak meters will also detect overshoots of up to 0.2 dB with LoudMax ISP detection. So if you need to guarantee a true peak level of -1.0 dB for example, set the output level to -1.2 dB or even -1.5 dB. Using ISP will double the CPU utilization and increase latency by 6 samples. LoudMax changes the latency dynamically when ISP is switched. Note that most hosts do not adjust latency compensation while playing, but at the next stop/start. IN NO EVENT SHALL THE AUTHOR BE LIABLE FOR ANY CLAIM, DAMAGES OR OTHER LIABILITY, WHETHER IN AN ACTION OF CONTRACT, TORT OR OTHERWISE, ARISING FROM, OUT OF OR IN CONNECTION WITH THE SOFTWARE OR THE USE OR OTHER DEALINGS IN THE SOFTWARE. 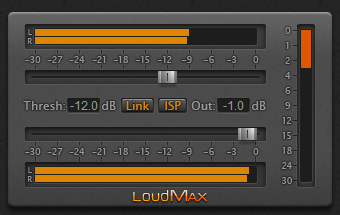 LoudMax is freeware and not commercial in any mean. You may not distribute and/or modify LoudMax without having an explicit permission from me.